By Sarah George - 20 August 2018, source edie newsroom. 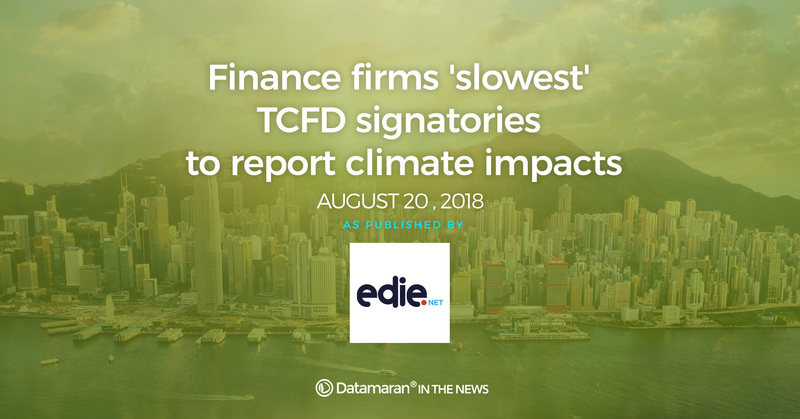 The study, carried out by risk analysis firm Datamaran, analysed how 152 TCFD signatories from a mix of financial and non-financial services companies covered greenhouse gas (GHG) emissions, climate change and air emissions in their annual financial reports. ​It reveals that just one-third of the financial service signatories studied placed a “high emphasis” on their GHG emissions in their reporting this year, compared with 78% of their non-financial services counterparts. Similarly, 53% of financial service signatories studied were found to have placed a “high emphasis” on climate change issues in their 2018 reports, compared with 68% in non-financial services. “It is not surprising that climate change is not seen as a material topic in the financial services sector itself, however [companies in the sector] have the power to influence the market through impact investments, green bonds and loans,” said Datamaran’s director of innovation, Donato Calace. There are more than 200 TCFD signatories across all sectors, accounting for $44bn in average market capitalisation. However, the study found that financial services have consistently placed less emphasis on the environmental aspects of reporting since the TCFD recommendations were introduced in 2015. The study concluded that the gap between both groups had been “stable throughout the years” with “no sign of widening or closing”. No financial services firms were found to have emphasised their air emissions impacts in their reporting, with Datamaran attributing this lack of coverage to the issue “not being a material topic” for such companies. Comparatively, almost a quarter (23%) of non-financial services firms were found to be reporting with a high emphasis on air emissions. Despite renewed focus from the financial sectors on climate-related disclosure, internal practices are still in need of improvement. Recent research from investment watchdog ShareAction, for example, found that the shortcomings of global banks on climate action could undermine efforts to achieve a 2C world. This study was backed by more than 100 investors worth almost $2trn in assets. Similarly, a report from Boston Common Asset Management revealed that in areas such as climate strategy, risk management and low-carbon opportunities, the banking industry is failing to embed climate action into its core practices. It found that less than half of banks (49%) are implementing climate-risk assessments of 2C scenario analysis, while even less (46%) have set explicit targets to promote low-carbon products and services. In a bid to improve the situation in the UK, the Government earlier this year committed to fund a new Green Finance Institute alongside the City of London Corporation to "champion sustainable finance" both nationwide and abroad. The move came after the launch of the Government’s Green Finance Taskforce, which aims to assist the low-carbon economy and boost the UK's position as a "world leader" in clean growth investment.